Thought I had to conduct creative writing lesson over at Pioneer Primary but it's the CA week so here I am blogging instead. The beginning of the week is always a busy one for me. Tuesday: Nyla has swimming lesson. Wedesday: Nyla has piano lesson. (GREAT deal this one over at GROUPON. 2 months,8 lessons (45 min per lesson), I only paid about $60 plus. Nyla is enjoying herself so much that I'm gonna sign on and let her continue. My very generous sister in law also has kindly donated her Farha's piano to us so we just need to tune it and Nyla can have daily practice sessions at home. Thank you Aunty Wati and Kakak Farha! Hugs! Nyla has no idea that the piano will be reaching this Saturday. Gonna surprise her. And last Sunday's flea market over at Eunos. Man, that was a blast. Felt real good to catch up with the girlfriends considering now that school has reopened, we are all occupied with the family and work. The kids were all over the void deck thinking of ways to get the crowd to visit our booth! The guest of honour taking a look at Nyla's books. That guy with the 'Shhhh' sign. He is so talented that I MUST do a blog entry on him. Sharing is caring and this guy is amazing, I tell you. Soon. Akan datang. The day before, she was perfectly alright about selling her soft toys. Then, separation anxiety kicked in for her. She started crying and pleaded with me to keep her stuffed toys. So from about 20 soft toys, we ended up putting only 5 for sale. The rest of the 15 soft toys are now sitting in her room collecting dust. By the way I really like the 'barcode' scarf I wore to the flea market even though the guys made fun. They were like," Ok don't forget to scan the sold items on Nura's head!" I think the scarf is damn cool. You can get this SIXTEENR scarf right HERE. Called the 'BARCODE' scarf, the message "Security Scan Scarves that Empower" is written on the edge of the fabric. Cool stuff. Only $24.99! "Mdm Goh asked me whether I want to become a mometer you know'''." Either her Mdm Goh asked her to bring a THERMOMETER or she wanted to appoint Nyla as the class MONITOR. Clarified with Nyla and she said,"Oh ya. Monitor. That sounds righter." "More right, Nyla." I replied. E and I were happy but not too over the moon type la. 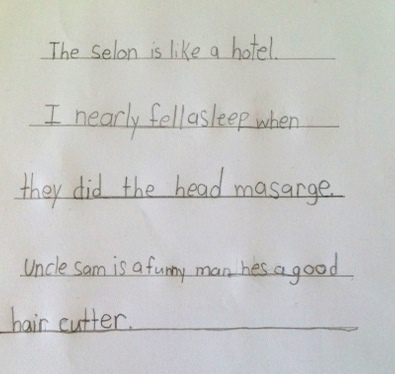 Kids sometimes anyhow say what. Then today, as she alighted from her school bus, I spotted something shiny pinned under her name tag. She beamed when she noticed me gasp. "I told you! You and daddy don't believe me!!!" And she ran to the playground with her friends right after that. I felt a little bad for not taking her too seriously peviously when she broke the news. While watching her play, of course proud momma here mass- whatsapped loved ones to share the good news that Nyla is officially a class monitor. Chiltern House mommies, thank you too for sharing the joy! And Desiree, congratulations on being the class monitress too! "Syukur Alhamdullilah. Penat mak jahit baju harini semua hilang! Nanti Mak nak sujud syukur." Then shortly after, Nyla's fan number 2 called. Papa J: Tell Nyla tomorrow evening we go for ice cream okay. Don't need to shower. I want to see her in uniform wearing the monitor badge. Funny how when I was in primary school, these leadership roles such as monitor and prefect were highly sought after. Wait...correction...the ties and the badges were the ones I was after. Once I got hold of the prefect duty list and timetable, life started going downhill. Damn depressing can? You do duty and then you watch your friends play catching. Bleargh. Heh! 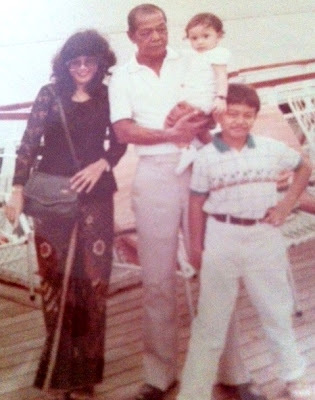 Those were the dulu days. 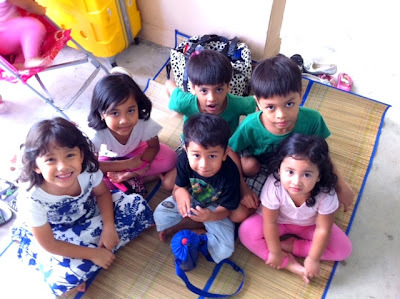 Most of the times we choose these children because they are well behaved, reliable, responsible and helpful. However there were also instances when I chose the rebellious, notorious ones as group leaders for them to step up. Whatever it is, I hope Nyla was chosen because she possesses the positive qualities. Dear Nyla, I hope you enjoy your stint as the class monitress together with your other classmate, class monitor Kosei. May the both of you be positive role models to your other classmates and be reliable 'right hand men' to your beloved Mdm Goh. 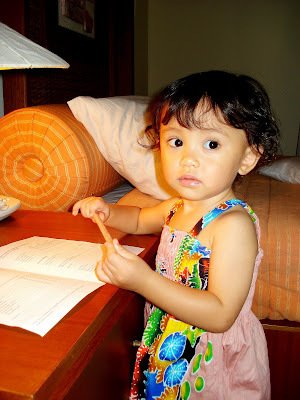 And Nyla, I hope you will never abuse your power. 1) You must be fair to all your classmates. When you catch someone making noise, you write his/her name on the whiteboard..even though if that classmate comes from your own group. 2) You must be auto and always offer help to Mdm Goh. 3) You must pay attention in class and complete your homework. 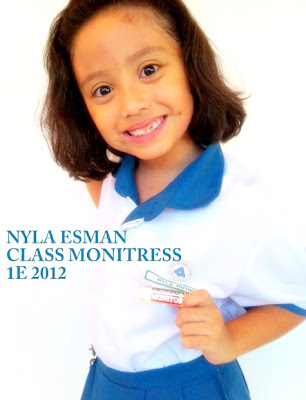 Okay whatever it is, CONGRATULATIONS Nyla on being the class monitress of Primary 1E. Nyla took one look at the new ponchogas and she said,"Like Deepavali style huh?" Then she explained further and told me and her Tok Mummy that the designs on the ponchogas reminded her of her past Deepavali celebrations at her pre school, Chiltern House. Since we are going Indian, I thought why not we name the latest individual ponchogas according to the Bollywood beauties? Nyla, there are other famous people you know. Not only Justin Bieber/Selena Gomez/Katy Perry hor. I showed her pictures of the Bollywood beauties and here are Nyla's shortlisted 7! 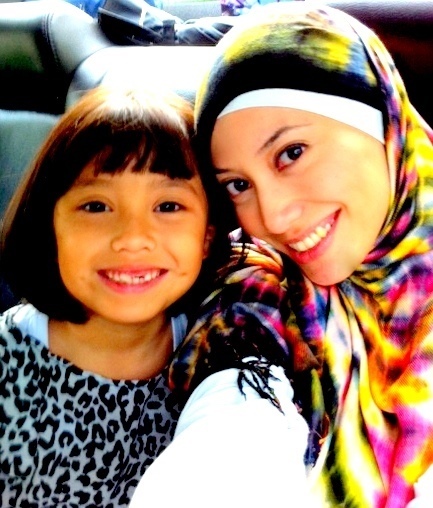 Sanggup the both of us buat collage you! So fun cos all these ladies are so so so gorgeous!!! Last Saturday, Tina, and my RebelPixel brudders Aza, Jali, Franco, Ash, Zahren and Mad Sunny roped me in for their assignment with DeChamp Model which was founded recently to spot raw talents and train these 'unpolished gems' professionally. Thank you my dear sister and brudders! And I must thank DeChamp models for trying their very best to rock my ponchogas. 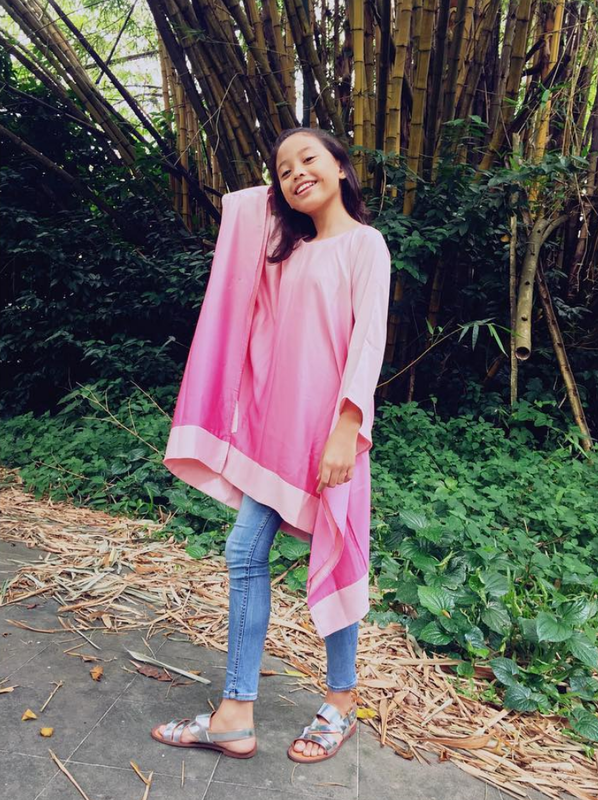 These Excluzif ponchogas are free size, fits S to L.
Do email me over at nuraesman@gmail.com! Email your beautiful shots to dechampmodel@gmail.com and they will get back to you right away. 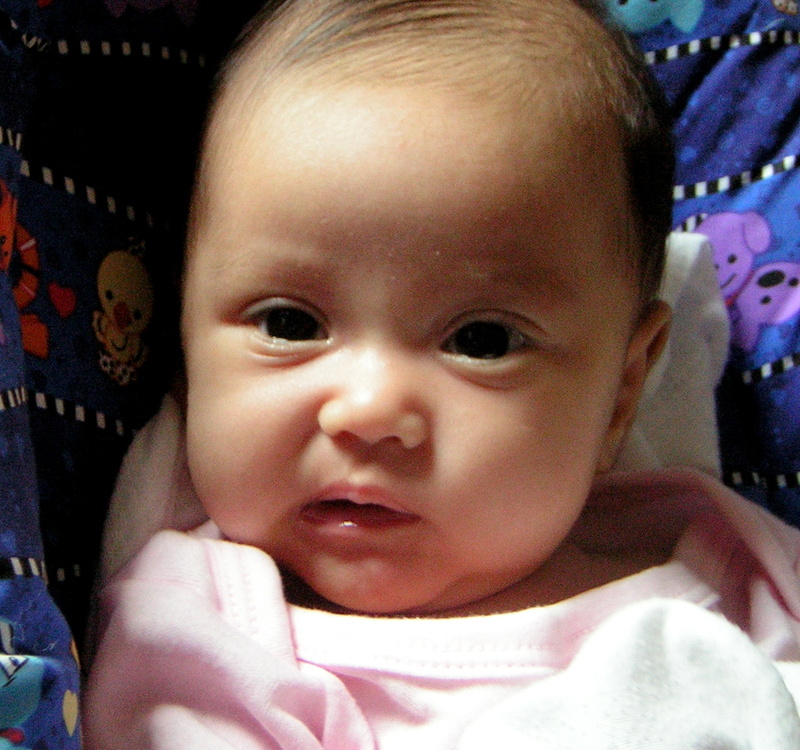 As you can see from the picture above, baby Nyla had very little hair. And those little fine hairs you see on that head of hers looked super duper ultra straight then. 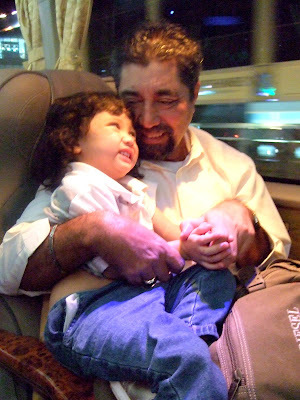 See my hair when I was about 2 years old last time. Also terjuntai kind..
That's my Yayi carrying me. The most patient and nicest man ever. And we all said hello to a head of 'springs'!!! Dari mana ni dapat rambut kerintingz semacams???? 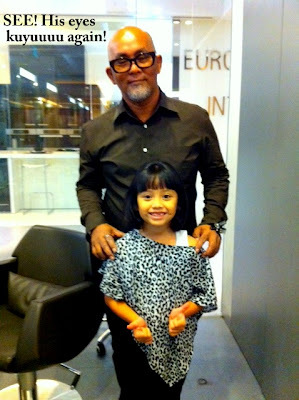 Now that she has started primary school, Nyla finds it a chore to wash her hair, wait for it to dry, go through a rather rigorous combing process no thanks to her tangled tresses and finally the ikat rambot part. She HATES having her hair tied. 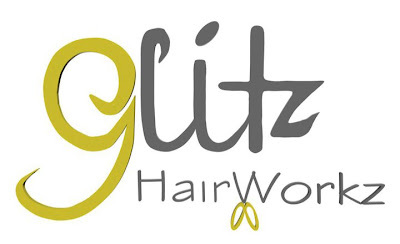 Regardless whether it is a simple ponytail/pigtails or fancy schmancy plaits. She doesn't care. 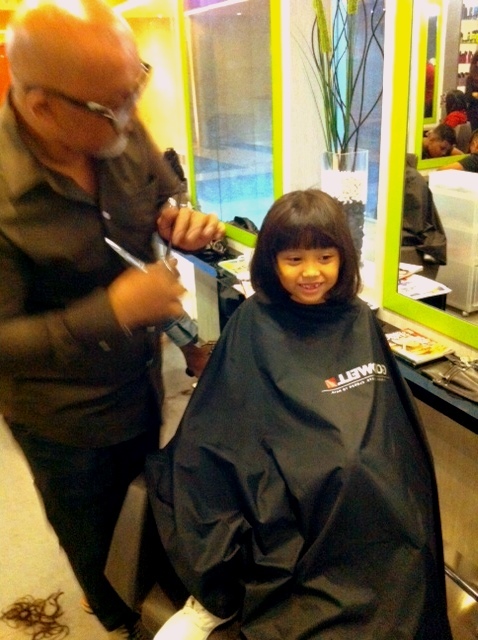 The past week, she pleaded with me, "Mommyyyyy, please cut my hair." Me: Sooooo sayang seh Nyla. Your hair is long! And with that I promised her that her wish is my command. choosing books in the library (Never mind that her books will surely be about hamsters/cats! )...choosing what to wear (She's a leggings freak! )....and now, choosing which hairstyle suits her best. Anyway, Nyla's hair definitely requires a different kind of care. With her, I used lots of conditioner and detangler cream. So, she must go to someone who really knows how to cut and style all kinds of hair. 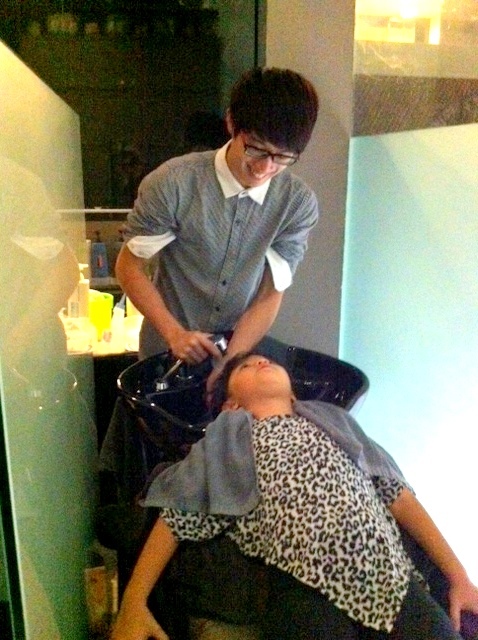 No need to look far for this kind of super hairstylist la ah. And later on, my ultra short hair. Both times, FTW kind of feel for me! 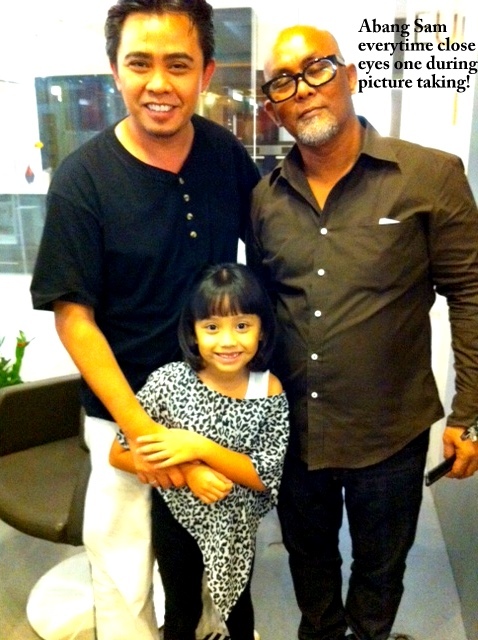 So last Saturday, Mr E and I brought our girl to GLITZ HAIRWORKZ where Abang Sam is based at. See that smile on my girl's face? Can you feel her excitement? She has been looking forward to this moment for quite a long time man! You want a guranteed nice hair make over babesies/hunkies? Really don't have to look no further. Look for SAM yo for a guranteed awesome hair makeover. 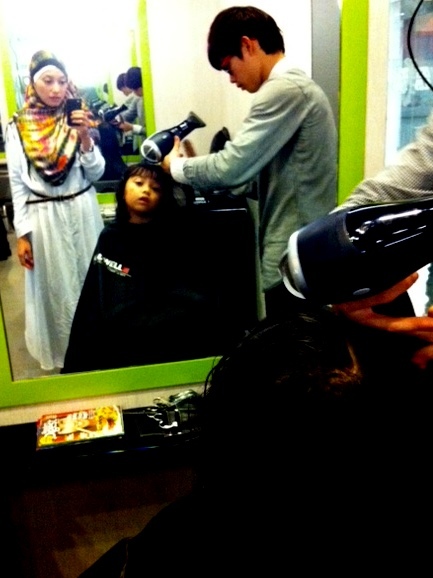 Abang Sam has done wonders to my hair pre-hijab days and now, he has another satisfied 6 year old customer. For appointment, do call or SMS SAM at 90258774. Abang Sam, thank you for letting my gerek readers enjoy this privilege. 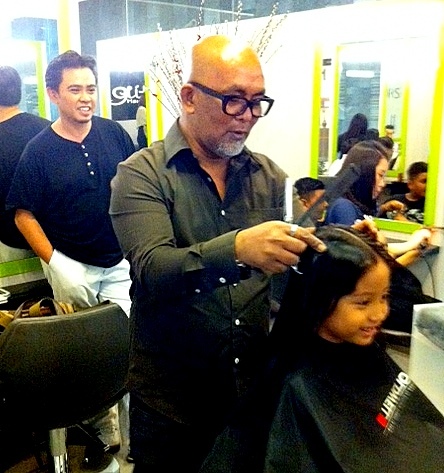 And, thank you even more for doing your magic on my daughter's hair.